You summon a twilight tormentor. Once summoned, you can activate the twilight's special ability to grant it a damage bonus to high health enemies. You summon a twilight matriarch. Once summoned, you can activate the twilight's special ability to heal the matriarch and up to 2 other friendly targets. Summon Winged Twilight: Call on Azura to send a winged twilight to fight at your side. The winged twilight's attacks deal [2401 / 2522 / 2641 / 2760] Shock Damage. Once summoned, you can activate the winged twilight's special ability, causing it to heal the winged twilight and 1 other friendly target for 4800 Health. The winged twilight remains until killed or unsummoned. Summon Twilight Tormentor: Call on Azura to send a twilight tormentor to fight at your side. The twilight tormentor's attacks deal [2760 / 2879 / 3001 / 3122] Shock Damage. 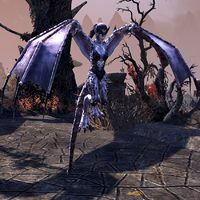 Once summoned, you can activate the twilight tormentor's special ability, causing it to deal 50% more damage to enemies above 50% Health for 15 seconds. The twilight tormentor remains until killed or unsummoned. Summon Twilight Matriarch: Call on Azura to send a twilight matriarch to fight at your side. The twilight matriarch's attacks deal [2760 / 2879 / 3001 / 3122] Shock Damage. Once summoned, you can activate the twilight matriarch's special ability, causing it to heal the matriarch and up to 2 other friendly targets for 6000 Health. The twilight matriarch remains until killed or unsummoned. Summon Winged Twilight summons a Winged Twilight familiar to aid you in battle. The familiar remains until killed or unsummoned. The Summon Twilight Tormenter morph summons a Twilight Tormenter with a special ability which you can activate by casting the spell again while it is alive, which causes its attacks to deal more damage to enemies above 50% Health. Alternatively, the Twilight Matriarch summoned by Summon Twilight Matriarch has a special ability which will heal it as well as up to two allies when cast again while alive. It is possible to use this skill along with Summon Unstable Familiar, allowing you to have two summoned allies at once. This familiar attacks with lightning attacks, generally keeping her distance from the enemy. This makes her less likely to be killed in battle than Unstable Familiar and its morphs, but also less likely to draw fire away from you. Twilight Tormentor's special ability bears the distinction of being the only attack in the game that does more damage to high Health enemies. This makes it a good complement to the various Execute abilities that deal more damage at the low end. Summon Twilight Matriarch is a recommended morph for the Sorcerer Initiate and Eldritch Mender builds. Rebate: Fixed an issue with this ability. It will now properly recover magicka when your Summoned Winged Twilight is killed. This pet no longer gives experience if you kill him. Increased the damage dealt by the winged twilight and all its morphs by 15%. Summon Restoring Twilight: Slightly increased the damage boost, and slightly reduced the twilight's health. The Restoring * Twilight also now grants nearby allies the Minor Intellect buff. The Restoring Twilight pet gets 1% more bonus damage with each rank. Summon Twilight Matriarch: This pet now heals for the same amount at each rank of the ability, and also receives increased bonus damage with each rank. This ability and its morphs are no longer toggle abilities; instead, they are now normal casted abilities. * The first activation will summon your pet, and when morphed, the second activation will cast the pet's special ability. This pet's special ability will now empower it, granting it a buff for 15 seconds that increases the Twilight's damage by 50% against targets above 50% Health. Renamed this morph to "Summon Twilight Tormentor." This pet's special ability will now cause it to heal itself and up to 2 friendly targets for 20% of your maximum Magicka. Developer Comment: We moved the class defining defensive ability up one slot so players who are leveling up can gain access to it earlier. Increased the health of the pet summoned by this ability and its morphs by 100% (15889 Health at CP160, up from 7945). Fixed an issue where ranking up a summon ability (Unstable Familiar, Summon Winged Twilight, Feral Guardian, etc.) would unsummon your pet. Summon Twilight Matriarch: Fixed an issue where this morph's heal ability could heal through walls. The pet summoned from this ability now has a basic heal special ability that can be used while the pet is active. Summon Twilight Tormentor (morph): Decreased the cost of the special attack from this morph by approximately 15%. Developer Comment: These abilities were too costly for their overall impact and frequency of casting. This should increase the damage of Sorcerer pets. This page was last modified on 30 March 2019, at 21:09.